Around 8,700 people have submitted application forms for the government’s home ownership programme while tokens have been issued to a further 17,000, housing minister Dr Mohamed Muiz revealed yesterday. Speaking at a press conference about the ministry’s achievements during the past year, Muiz said application forms would be accepted until February. The ministry would assess the applications and make home visits to determine standard of living, he added. The government announced the ‘Gedhoruverikan’ social housing scheme in February. The Ministry of Housing and Infrastructure reopened the Dharubaaruge convention centre in Malé on Thursday (August 7) following renovation and repair work. Housing Minister Dr Mohamed Muiz told the press at an opening ceremony that the project had cost MVR5 million (US$324,254). Muiz explained that extensive repair work was needed for the convention centre as the roof leaked when it rained, the stairs were dilapidated, and the walls were crumbling. In addition to repair work and a new paint job, Muiz said glass panels, wall fabrics, and carpets have been replaced. The ministry has also decided to make changes to rental prices for leasing Dharubaaruge halls for private functions, Muiz continued, while food and drink would not be allowed in the Rannabadheyri, Hiriya, and Hakura halls. In May, following a long-running dispute over jurisdiction and ownership, the housing ministry took over Dharubaaruge from the Malé City Council, with police deployed to change locks. The convention centre was constructed ahead of the SAARC summit held in Maldives in 1990. The government expects to sign a revised agreement with Tata Housing Developing Corporation next week to resume stalled housing projects in the capital Malé, Housing Minister Dr Mohamed Muiz revealed at a press conference yesterday. The terms of the agreement were revised on the advice of the cabinet’s economic council after agreeing to some of Tata’s conditions, Muiz explained, and have now been forwarded to the Indian real estate developer for final approval. “We have agreed that work must begin in two sites in Malé within 45 days of signing the amendments [to the contract],” Muiz said, referring to the Gaakoshi plot and former Arabiyya School premises. Muiz further revealed that the government has also agreed to give back the vacant ‘Naadhee’ plot in Malé and approve construction on the site. The site was taken over by the administration of former President Dr Mohamed Waheed with the intention of building a new Supreme Court complex on the premises. While the previous administration had offered a plot in Hulhumale’ as an alternative, the developers felt the change would affect financing of the project. The multi-million dollar housing project – a combination of commercial and social housing through a Public-Private Partnership model – was signed in May 2010 by the administration of former President Mohamed Nasheed with Apex Realty Pvt Ltd, a special purpose vehicle (SPV) or joint venture formed between Tata (65 percent) and SG18 Developers (35 percent). Providing affordable housing to resolve the acute housing shortage in the capital was a core pledge of the Nasheed administration as well as the current Progressive Party of Maldives-led (PPM) government. The Naadhee plot on Sosun Magu was among four plots of land in the capital awarded to the Tata subsidiary for construction of flats. The Waheed administration’s decision to take over the plot was the source of the dispute with Tata, Muiz conceded yesterday, which has now been resolved after the economic council decided to give back the plot in accordance with the terms of the original agreement. The government has agreed to purchase 20 percent of the flats constructed on the plot, he noted. Discussions were meanwhile ongoing between the Supreme Court and the President’s Office on a new site for the apex court’s building, he said. The flats in Gaakoshi and the old Arabiyya School site would have to be completed in 10 months and a year respectively, Muiz continued, while Tata has also agreed to construct 150 flats in Hulhumale’. In May, Apex Realty announced that the company was prepared to resume work on the project as soon as the agreed upon amendments were incorporated into the contract. “Apex Realty officials have undertaken multiple rounds of meetings with the economic council of the cabinet and the Ministry of Housing to find a mutually acceptable solution to contractual issues,” the company said in a press release. “We are committed to the Maldives project and can start the project within 45 days after the final nod is received from the Housing Ministry and contract amendment is signed,” said Mr Sandeep Ahuja, Director at Apex. Housing Minister Dr Mohamed Muiz has told the Majlis of plans for a large number of infrastructure projects in Addu City this year. Construction of housing units, harbours, roads, health centres, sports facilities, and mosques as well as upgrading of schools are among development projects in the pipeline for the Maldives’ southernmost atoll. Responding to a query from Addu Meedhoo MP Rozaina Adam at today’s sitting of parliament, Muiz said that developing the second city was a priority of President Abdulla Yameen’s administration. Muiz noted that harbour construction in the Hithadhoo and Hulhumeedhoo wards were underway and were expected to be completed by the end of the year. A project for deepening the Maradhoo harbour is also expected to commence this year, he said. Preparations were also underway to commence a road construction project in Addu City, Muiz revealed, adding that the ministry expected to award the project to a contractor in July. Questioning of ministers resumed in parliament today after a hiatus of more than two years. Under parliamentary rules of procedure, MPs are allowed to pose questions to cabinet ministers at parliament sittings following a 14-day notice. Continuing the list of development projects, Muiz said permits have been secured from the Addu City council for a housing project financed by a loan from the Chinese EXIM bank, for which “detailed drawings” have now been completed. “The work that is currently ongoing is putting up fences around plots of land designated for this project and preparing the site,” he explained. Application forms have also been processed for 25 row houses built in the Feydhoo ward by the Housing Development Corporation (HDC), said the minister, noting that the final list was announced on June 11 – while the lottery draw took place yesterday (June 23). Moreover, projects overseen by the Office of Programmes and Projects – which functions under the Housing Ministry – include the upgrading of the Addu zone stadium ahead of May’s AFC Challenge Cup and the construction of classrooms in Hithadhoo, he said. Projects in the bidding stage meanwhile include construction of a mosque in Meedhoo with a capacity of over 700 worshippers, the addition of eight classrooms to the Hithadhoo Nooranee School, and construction of a four-storey building in Feydhoo with 12 classrooms. The ministry expects these projects to commence during 2014, Muiz said. A “design and supervision consultancy agreement” has also been signed for the construction of a 100-bed hospital in Hithadhoo with loan assistance from the OPEC fund, Muiz revealed. Discussions were presently ongoing with the Addu City council on designating a different site for the hospital as the plot of land initially chosen was adjacent to a football stadium, Muiz added. The minister explained that changing the site would require approval of the financier, which could see the project halted for some months. Harbour construction in the Meedhoo ward is meanwhile expected to be complete by the end of November. Following Muiz’s answer, opposition Maldivian Democratic Party MP Rozaina inquired about stalled road construction and installation of street lamps in Hulhumeedhoo. She noted that the road construction project was launched by the Road Development Corporation in May 2013 under an agreement to complete the work within a year. In response, Muiz said discussions were ongoing with the Finance Ministry to secure finances for the stalled road construction project. Installation of street lamps was a municipal task undertaken by the city council, he noted. Housing Minister Dr Mohamed Muiz and Deputy Minister Abdulla Muttalib have signed for the Maldives Development Alliance (MDA), local media reports. Muiz had been a senior member of the religious conservative Adhaalath Party (AP). According to Sun Online – owned by MDA Leader Ahmed Siyam Mohamed – Deputy Minister of Education Ismail Shafeeu and former Kooddoo Fisheries Managing Director Mohamed Muttalib have also signed for the government-aligned party. Following the expulsion of the Jumhooree Party from the ruling coalition, the MDA remains the only coalition partner of the ruling Progressive Party of Maldives. Male’ City Council (MCC) has denied receiving any notice from the Housing Ministry requesting it hand over the Usfasgandu grounds, which it continues to lease to the opposition Maldivian Democratic Party (MDP) for campaign activities and rallies. Male’ Mayor Ali Manik said this evening that despite hearing rumours Housing Minister Dr Mohamed Muiz had given the council ten days from tomorrow (June 18) to clear and hand over the plot of land, he had not received any information on the matter from the government. Housing Minister Dr Mohamed Muiz however told Sun Online today that a notice had been sent to the MCC today for them to clear and vacate the area by June 27 – or else police would be requested to assist in clearing the area. The housing minister was quoted as saying that the state would not be taking responsibility for any damage caused to items of equipment left on the site after the requested handover date. Dr Mohamed Muiz also told local media today that the MCC had previously been sent a notice on February 25 requesting it hand over Usfasgandu to his ministry within seven days, a request that was not made following a court ruling. The ministry sent the notice in February just a day after the High Court overturned a Civil Court ruling backing the government’s order that the land be handed over to state authorities. The High Court claimed at the time that the lower court had not followed legal procedures in the case. Usfasgandu was handed back to the MDP by the MCC in March of this year. The council claimed at the time that no other party had requested use of the land at the time. Muiz was not responding to calls from Minivan News at time of press. MDP MP and Spokesperson Hamid Abdul Ghafoor said today that the party had not received any official notice from the housing ministry regarding calls to clear the site within ten days. He alleged that the reports of the Housing Ministry seeking to reclaim Usfasgandu reflected an attempt by the state to intimidate political rivals such as the MDP and its supporters ahead of an election in an attempt to destabilise the country ahead of September’s presidential election. Ghafoor refused to speculate at present on whether the MDP would hand back the land should an official request be received. He responded that authorities had previously sought to take Usfasgandu back from the MDP in the past, but had been unsuccessful due to what he claimed was “public pressure”. A media official for the Maldives Police Service (MPS) told Minivan News that it had received no request or notice from the Housing Ministry for assistance in clearing the site. Male’ City Council leased the Usfasgandu area to the ousted ruling party in March 2012, prompting repeated attempts by the government to reclaim the area on the grounds it was being used for criminal activity, including the practice of black magic. The MDP had moved to the area after a previous protest camp at the tsunami monument was dismantled and completely repainted by police and military on March 19, 2012. On May 29,2012, police raided the Usfasgandu site after obtaining a search warrant from the Criminal Court, ordering the MDP to vacate the area. The Maldives National Defence Force (MNDF) then began dismantling the protest camp. The Housing Ministry filed a case with the Civil Court after the MCC refused to hand the land plot to the ministry. The government has decided to delay implementation of new development projects financed out of the state budget due to shortfalls in revenue, Finance Minister Abdulla Jihad confirmed to Minivan News today. Jihad said that the cabinet decided to postpone planned infrastructure projects that have not yet started in an attempt to ease cash flows rather than deducting a specific amount from the development budget. “We are in the process of [drawing up a supplementary budget]. Hopefully by the end of the month we will have something,” he said. The decision to suspend new projects was revealed by Housing Minister Dr Mohamed Muiz today following the signing of contracts to build harbours in four islands. Speaking to press after the signing ceremony, Muiz said he was instructed by the finance ministry not to commence any further infrastructure projects included in the 2013 budget, such as harbour construction or land reclamation. Muiz explained that government-funded projects in the pipeline will be pushed back until parliament passes bills to raise additional revenue. The move follows parliament’s rejection last week of government-sponsored legislation to raise the airport service charge to US$30, which was among a raft of measures proposed by the Finance Ministry in the estimated 2013 budget to raise MVR 1.8 billion (US$116 million) in new income. Other measures included hiking Tourism Goods and Services Tax (T-GST) to 15 percent from July 2013 onward, leasing 14 islands for resort development, introducing GST for telecom services as well as oil, and “selectively” reversing import duty reductions. Following the narrow defeat of the airport service charge amendment bill in parliament, Jihad told local media that a “significant amount” would be lost from projected revenue as the additional income was anticipated in budget forecasts. “If the amendments for the import duty are not passed, we will find it extremely difficult to manage the budgets of institutions. So it’s critical that the parliament expedites work on the bills and support them,” he was quoted as saying by newspaper Haveeru. The bill proposed by the government to raise the airport service charge was defeated 28-27 despite the ruling coalition’s provisional majority in the 77-member house. During the parliamentary debate last week, MPs of both the opposition Maldivian Democratic Party (MDP) and government-aligned Progressive Party of Maldives (PPM) – respectively majority and minority parties in parliament – accused President Dr Mohamed Waheed of using state funds to finance his presidential campaign. Dr Waheed meanwhile told the people of Thulusdhoo in Kaafu Atoll yesterday (April 20) that there was no cause to worry about the budget or rumours of impending bankruptcy. “The Maldivian economy is not really that bad,” he was quoted as saying by Haveeru. President Waheed however conceded that “difficulties” had arisen due to spending beyond the country’s means in the recent past. As a consequence of deficit spending financed by loans, Dr Waheed said the government had to spend an amount almost equal to the state’s wage bill on interest and loan repayments. “We Maldivians are not indebted to anyone. We are proud people. We pay back what we borrow. We don’t have any outstanding payment, to any party,” Dr Waheed said in his speech, according to the President’s Office website. He added that the finance ministry was preparing to submit a supplementary budget to parliament before the end of April, which would seek funds needed to provide services to the public without interruption. Economic Development Minister Ahmed Mohamed – a senior member of the government-aligned Dhivehi Rayyithunge Party (DRP) – however told Haveeru last week that a supplementary budget would be of no use if parliament failed to approve the proposed revenue raising measures. The minister also referred to media reports suggesting that some government offices have exhausted their annual budgets after the first three months of the year. During the budget debate in December 2012, Majority Leader MP Ibrahim Mohamed Solih warned that the additional revenue projected in the budget was unlikely to materialise. Moreover, he said at the time, the MDP would not support increasing T-GST without consultation with the tourism industry. Predicting that revenue in 2013 would reach “only MVR 11 billion at most,” Ibu warned that income would not be enough to meet recurrent expenditures on salaries and administrative costs. Meanwhile, Minority Leader MP Abdulla Yameen, parliamentary group leader of the PPM, said at the time that the government’s objectives or policies could not be discerned from the proposed budget. “These projects are very random or ad hoc. The government’s planning should be better than this,” he said. While President Waheed had taken note of the high salaries paid by institutions such as the People’s Majlis as “a serious problem,” Yameen said he could not see “any kind of sign” of reducing recurrent expenditure or salaries and allowances for government employees. The state’s wage bill amounts to 48 percent of recurrent expenditure, which accounts for 70 percent of government spending. A public sector investment program (PSIP) of MVR 3.1 billion (US$201 million) was proposed within the 2013 budget. This included MVR 1.5 billion (US$97 million) from the state budget, MVR 21 million (US$1.3 million) from domestic loans, MVR 1.2 billion (US$77 million) as foreign loans and MVR347.6 million (US$22.5 million) as free aid. 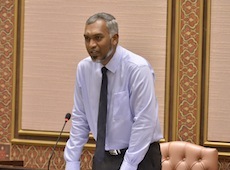 After parliament trimmed more than MVR 1 billion (US$64.8 million) from the MVR 16.9 billion (US$1 billion) budget submitted by the Finance Ministry, Jihad warned that funds allocated in the budget would not be enough to manage expenses and predicted that a supplementary budget would be needed before the end of the year. Parliament’s Budget Review Committee approved MVR 1.6 billion (US$103.7 million) in cuts from recurrent expenditure and added MVR 389 million (US$25.2 million) for infrastructure projects. The budget items that the committee reduced included; overtime pay (cut 50 percent), travel expenses (cut 50 percent), purchases for office use (cut 30 percent), office expenditure (cut 35 percent), purchases for service provision (cut 30 percent), training costs (cut 30 percent), construction, maintenance and repair work (cut 50 percent) and purchase of assets (cut 35 percent). The committee also instructed the Finance Ministry to reduce an additional MVR 605.7 million (US$39.2 million) from office budgets. In December 2012, the Finance Ministry ordered offices to cancel all overseas trips, such as for study tours and training, and to seek approval from the ministry for all official trips that were not completely funded by foreign parties; cancel all repair work for the rest of December; and cancel purchases of capital items that were not included in the public sector investment programme (PSIP). However, since government spending necessary to provide essential services to the public could not be reduced, “the state’s expenditure has to be further controlled as additional measures are needed to reduce the state’s budget deficit,” the circular stated. In July 2012, the Finance Ministry instructed all government offices to reduce their budgets by 15 percent, with only 14 of 35 offices complying by the given deadline. “Some offices will face difficulties. But we don’t have a choice,” Jihad told local media at the time. Leaders of the religious conservative Adhaalath Party have claimed legislation passed by parliament last week requiring political parties to have a minimum of 10,000 registered members was a direct attempt to dissolve the party. If the political parties bill passed on Thursday is signed into law, parties without 10,000 members would have three months to reach the legally required number or face being dissolved. At a press conference on Saturday, Adhaalath Party Leader Sheikh Imran Abdulla said he suspected that “black money” from Indian infrastructure company GMR was behind the decision to insert the clause requiring 10,000 members. Imran said the bill was intended to “eradicate” Islamic ideology from Maldivian politics and “defeat” the party’s efforts to oppose alleged attempts to secularise the country. “This is a big political and legal challenge [they] placed before Adhaalath Party. The way the political sphere in the country is shaped today, it is very important for a political party like Adhaalath Party to exist,” he said. Imran also argued that the bill also violated the constitutional principle of equality. Following preliminary debate in early 2010, the political parties bill was reviewed and finalised by the Independent Institutions Committee on December 10, 2012. Writing in his personal blog (Dhivehi) in October, Independent Institutions Committee Chair MP Mohamed ‘Kutti’ Nasheed revealed that “a clear majority” voted in favour of requiring parties to gain 5000 members before it can be officially registered, and 10,000 members before becoming eligible for state funds. “When the law is passed, the current registered parties with less than 5,000 members would be given a six month period to reach the figure. If a party fails to reach that figure by the end of the period, the particular party would be dissolved,” Nasheed explained. However, the minimum number of members was later raised to 10,000 and the period shortened to three months before the draft legislation was presented to the Majlis floor for Thursday’s vote. The political parties bill was passed with 64 votes in favour and four against. According to figures from the Elections Commission (EC), Adhaalath Party has 5,881 as of December 27. In October 2011, the party had 6,140 members. Only four parties out of 16 registered in the country have more than 10,000 members, including the formerly ruling Maldivian Democratic Party (MDP) and government-aligned Progressive Party of Maldives (PPM), Dhivehi Rayyithunge Party (DRP) and Jumhooree Party (JP). Speaking at yesterday’s press conference, Islamic Minister Sheikh Mohamed Shaheem Ali Saeed, chief spokesperson of the party, dismissed the notion that the minimum requirement of 10,000 members was approved for economic reasons as political parties were provided funds from the state budget. Shaheem criticised provisions in recently-passed legislation on MPs’ privileges guaranteeing retirement pensions after one term as well as overseas medical treatment for MPs’ family members as untenable expenses by the state. “When a MP serves a five-year term, the state has to pay him till he goes to the grave. And [the state] has to take care of him and his family,” Shaheem said. If state funding for small political parties was too costly, Shaheem argued that a monthly pay of more than MVR 12,000 for island councillors was excessive as well. Five-member councils in islands with very small populations had “nothing at all to do,” he claimed. Housing Minister Dr Mohamed Muiz meanwhile said that the membership clause was intended to get rid of the religious conservative party due to its efforts “on behalf of Islam” in recent years. Muiz referred to the Adhaalath Party’s successful campaign against proposed regulations to authorise sale of alcohol in city hotels as well as its opposition to making Dhivehi and Islam non-compulsory subjects in higher secondary education. He claimed that the party also put a stop to former President Mohamed Nasheed’s attempts to strengthen ties with Israel and “bring Jews” to allow them to “exert influence in the country”. Muiz, who also serves as the Adhaalath Party’s secretary general, called on “all citizens who love Islam” to sign up for the party. “Religion and politics cannot be separated. Calls by some secular individuals to separate religion and politics are dangerous,” he wrote in response to a purported question regarding the “Shariah judgment” on signing for Adhaalath Party. A “religious political party” in the Maldives was therefore “necessary and obligatory,” he contended. “Adhaalath Party is the only party formed to protect religion in the country. To say that all other political parties were formed for worldly purposes would not be demeaning them,” he added. The Adhaalath Party has announced that it would hold a rally on Thursday night to launch a recruitment drive to increase membership.